We are proud that Graig Wen was chosen by the Cool Camping Wales guide as one of the top 5 places to camp in Wales. Tent campers can pick their pitch from sheltered glades, secret meadows or high on a bluff overlooking the estuary. There is a car-free camping area for those who really want to get away from it all. 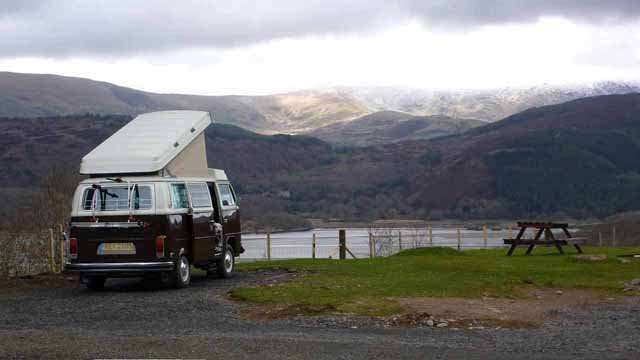 Campers with larger vans, motorhomes or caravans can pitch safely in our small touring site, where you will enjoy sweeping views over the Mawddach Estuary and surrounding hills and easy access to the washing facilities and showers. Sarah and John bought Graig Wen in September 2007. We are working to improve the washing/recycling facilities, extend the number of electric hook-ups and manage the conservation of 40 acres of Snowdonia National Park. But mostly we want to leave Graig Wen the way it is - wild and special.